1. The Libra Birthstones: The peaceful Sapphire and the faithful Opal: The Libra sign of the zodiac needs balance and harmony in order to thrive. It is a sign that loves beauty and tranquility in its life, elements the Sapphire can help bring into its life. The Sapphire can bring dreams to fruition, can restore equilibrium between the physical, mental, and spiritual, and can attract prosperity. Also, since the Libra soul is happiest when in a relationship, a Blue Sapphire would be beneficial for attracting love and Green Sapphire for ensuring fidelity. The third important element in a relationship is faithfulness, and for this ingredient, it is the Opal that can be used. An Opal can also stimulate creativity, release inhibitions, and unlock the intuitive side of ones nature. And if for some reason the Libra soul feels a bit insecure about his looks, the Opal can encourage a more positive outlook. 2. The Blue Celestite, Lapis Lazuli, and Ulexite Potential: The Libra sign soul is known mostly for its diplomatic abilities as well as its talent in achieving creating compromises and harmony within its environment. The Blue Celestine would be the crystal to use for supporting the elements mentioned above. Now, during a debate, it would be the Lapis Lazuli that would be the most beneficial because it would encourage the Libra soul to express its true opinion on a matter without backing of into a safer explanation just for the sake of harmony. If, however, a resolution to a conflict is no where in sight, the Ulexite would be the crystal of choice. Its strength lies in its ability to go to the core of a problem and to facilitate a resolution to the conflict. 3. 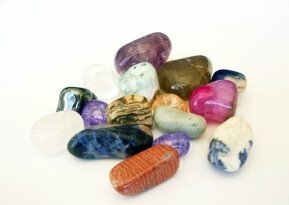 Libras Soul Pathway Stone  The Soulmate: The Soulmate crystal is a fascinating stone and is an ideal choice for the Libra soul. It is actually comprised of two equal-sized crystals growing side-by-side from a common base and joined along one side. The Libra signs soul path is that of relationship  both with the self and with others. Therefore, the Soulmate crystal can help the Libra soul not only find its other half, but also to remain an equal partner within the relationship.